Welcome to another week of Podunk Pickin's. 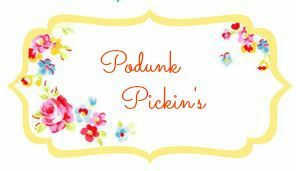 So what is Podunk Pickin's? Well it's started out as a day of the week for me to share with my readers free quilt patterns I'd found while surfing the quilty internet world. 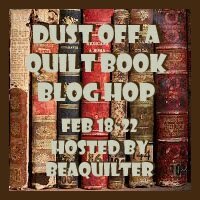 Then I thought it would be fun to let other bloggers link up quilting and sewing tips and tutorials from their own blogs and other social media. After a few weeks I felt like it was only fair to open it up to all my readers. You can link up as many as you like as long as it's quilting, sewing or crafty related. It doesn't need to be a tutorial or tip anything you've been working on is welcome! This week I want to share with you a free pattern from Lori Holt. To be honest I had no idea this pattern was free until just this week. It's her latest pattern for her new templates and fabric line Calico Days. LOVE LOVE LOVE this line of fabric! The pattern is called "Bloom". You can find the free pattern by clicking here. Lori will also be hosting a Sew along using this pattern. The details are in the free pattern download. The pattern is easy to follow with awesome block images. So now it's your turn to share what's been keeping you busy these past few days. Anything is welcome as long as it's sewing related. Of course we love to see tutorials old or new. Link up as many as you like. Don't forget to visit the other links and share the love. You just might find a new and interesting blogger! By clicking on the Podunk Pickin's image in the sidebar you can see all past Podunk Pickin's posts. 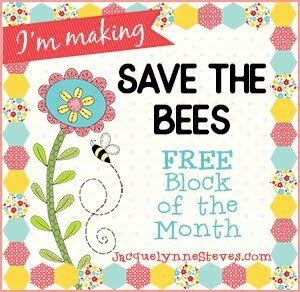 There's lots of fun and free projects shared by some very talented quilt bloggers. The Bloom pattern might be free, but you need to purchase the template set in order to make this quilt. The templates are bit too pricey just to make this one quilt. Not sure if I would use the templates again. But since most are simple shapes, I could just try making the blocks on my own using shapes I draw myself and see if I like it before investing in the templates themselves. Lori always has such fun patterns. Thanks for sharing this one.